When you leave on vacation or for business, the last thing you want to do is leave your pet, especially if your pet is going to be confined to a cage for the majority of the time you’re gone. With Cane Bay Pet Sitting & More, we ensure your pet gets to run free, play, and receive the attention it needs while you’re gone. We are also more flexible than traditional boarding houses and even offer last minute arrangements. View our pricing below. We encourage you to shop around and see how much of a value we are compared to our competitors. 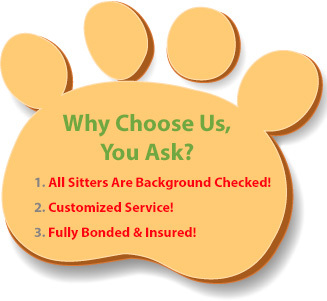 You will be able to meet your sitter before you make a final decision and no payment will be required. *Fees are based on many factors including the length of stay and any special needs or services you request. This means that our fee structure is flexible and personalized. For an accurate estimate and to answer any questions you may have, feel free to call us today. 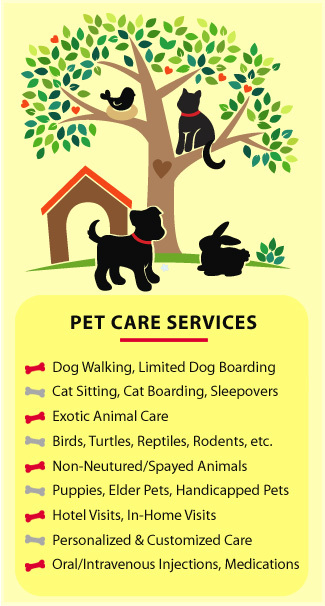 ** Please note, any requests to take care of your pet outside of our daily pet sitting service hours of 6:00 AM to 9:00 PM daily, will be surcharged $10.00 per occurrence. VIP Package and Limited Home Boarding is excluded. Our dog walking/pet sitting plans are highly customized for each of our clients. This allows us to give you exactly what you want per your budget and your dog’s needs. Please call us so we can work out a plan that works for you. All time slots include walking your dog (many options), refreshing water and food, play-time, accident clean-up, and lots of love and special attention for your dog(s)! All time slots include making sure water and food is filled up, three walks (many options), plenty of play-time, cleaning up any accidents, and TONS of love, attention, and belly rubs! These fees also include making sure your home is secure, collection of any mail or packages that arrive, newspaper collection, watering plants (indoors, front porch, and rear deck), and ensuring your trash/recycling is taken in and out on time. All time slots include ensuring your kitty has plenty of water and food, that all accidents are cleaned up, the litter box is maintained and fresh, and of course that your kitty has tons of special attention and play-time! The fees also include a standard home security check, mail, package, and newspaper collection, watering plants (indoors, front porch, and rear deck), and trash/recycling collection taken in and out on time. All time slots include water/food is full, tons of play time, cage clean up (nominal extra fee), and general maintenance. We will also perform a home security check, collect mail/packages/newspapers, watering plants (indoors, front porch, and rear deck), and even take your trash/recycling bins in and out on time. 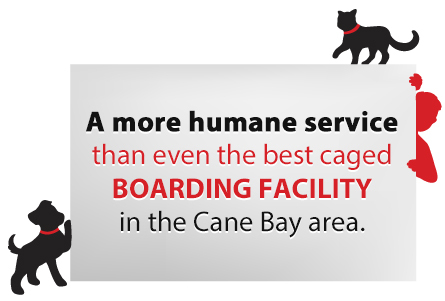 (If no other boarders are scheduled for the next day, your pet can stay with us another night. If other boarders are scheduled, you would need to pick up your pet before 5:00 PM. Same pickup rules will apply for the next day). We will make your puppy part of our family during their stay. As a guest, your dog will sleep in the house with us at night. And, unless you specify otherwise, we’ll never board your dog with other dogs. We’ll walk your best buddy 4 to 5 times a day according to their schedule, and feed them according to your instructions. We take immense pride in being trustworthy and professional. We know your dog will miss you, but – with us – time will fly by. This is our premiere package for the dog lover that wants it all for their furry friends. With this package your dog will never be alone for more than 4 hours (with three additional walks during the day). We will spend the night with your pets in your home (10 hours minimum). Are your pets used to constant attention? Our VIP Package allows us to “move-in” to give your pets the continual one-on-one attention that they are used to. Inherent with the service is the peace of mind that your home is cared for and looked after by an insured professional. This includes two walks, morning and evening (up to 30 minutes each) (and additional walks depending on mid-day option chosen) and everything described under the Vacation Plan Dog Sitting section. If they’re open, we’ll take your pet to your vet’s office. If not, we’ll use the closest emergency vet clinic and contact you immediately if there are any emergencies.